These 2 Tone Diamond Earrings have post backs, something else could be used if you want a different look or don’t like posts. 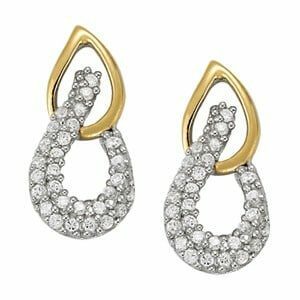 Each earring has 1/4 of a carat of 1mm diamonds in them, but other type and sizes of stones can be used as well. I can also make these in any other shape you desire. The listed price is for 14K Gold with CZ. Send me any other ideas you might have for custom diamond earrings and I will turn then into a reality…my canvas is ready for you to fill it up! Click HERE to see another 2 Tone Diamond Earrings design.